Some of you who subscribe to the RSS feed might have been puzzled to see that a new blog post went up yesterday afternoon for about an hour, and then came down again. It was about an old poker friend of mine who’s just confessed to murdering a prostitute in Thailand, chopping up her body and putting it in a suitcase. But I decided that was too grisly, so I’ve taken it down and I’m going to put up a recipe instead. MUCH NICER. Maybe I’ll write about the murder another time. Meanwhile, on the last post here (about poker hands), one of the commenters asked for a new recipe so here is one. One of the best things about going to the PCA tournament in the Bahamas is eating at Bobby Flay’s Mesa Grill. Mmmm. I’ve just gained half a stone, simply by remembering it. It’s kind of a spicy, southern American type of affair. 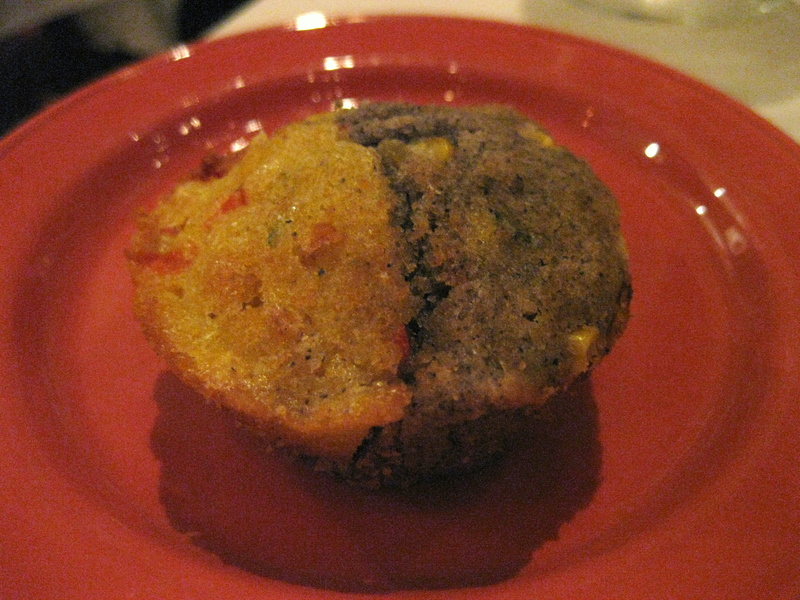 One of Bobby’s signature dishes is actually an “accoutrement”: his blue and yellow corn muffins. I tried to recreate them earlier this year, using Bobby Flay’s Mesa Grill Cookbook (it seemed the obvious book to use) but it was a challenge because the ingredients are so American. “Cilantro”, for example, I decided was absolutely impossible to come by here - until I realized that, for the UK market, it could simply be translated into “coriander”. Blue cornmeal, sadly, does not translate into anything you’ll find at Tesco. Modification is required. This is a ridiculous recipe because it contains about a million ingredients. But it’s worth it. These things are incredible. They make a brilliant side dish to almost any main course (though best to keep it light and vaguely thematic - grilled tuna on spicy rice, for example), they are a great savoury snack, and you can even put jam on them to make a weird and addictive kind of breakfast. Tip one: Bobby’s recipe demands blue and yellow cornmeal, and the whole thing is made in two separate batches, then combined later to make multi-coloured muffins. Sod that. I have yet to find blue cornmeal anywhere in the UK, and the recipe is bloody complicated enough without two-batching it. So this is my modified, slightly easier version. It’s not impressively blue-and-yellow striped but the various ingredients make for a colourful muffin nonetheless. 1. Preheat the oven to 400 F (200 C, bit lower if it’s fan-assisted). Grease a muffin pan (or mince pie tin) with butter. That’s what Bobby says - grease one tin. Ha! Be prepared to re-use the same tin over and over and over before the mixture’s finished. Or, if you live inside a branch of John Lewis, grease ten tins. 3. In a bowl, whisk together a cup and a half of whole milk, 4 eggs, 2 tablespoons of honey, half a cup of diced red peppers, 2 diced jalapeno chillies, half a cup of sweetcorn (tinned is fine) and 2 tablespoons of finely chopped fresh coriander. (Or “cilantro”, as Bobby calls it). No kidding about the millions of ingredients. Now, I personally don’t like the taste of fresh coriander. It makes me feel a bit sick. Nevertheless, once it’s cooked it is (a) tasty and (b) buried under such a weight of other ingredients that its main contribution is to make pretty green strands through the muffins. 4. Time for the 97,000 dry ingredients. For this you’ll need another bowl. Don’t whine to me about having to wash two of them up - if you were following Bobby’s recipe, you’d be on your sixth bowl by now. For this simplified version, put two cups of cornmeal into the new bowl (or coarse polenta - which may be the same thing, I’m not sure, but I’ve tried making it with both and they’re both fine). Add one and a half cups of flour, 3 teaspoons of baking powder, half a teaspoon of bicarbonate of soda and 4 teaspoons of salt. Mix mix mix. 5. Now combine the contents of both bowls and the saucepan, and mix. That’s your batter. It’s probably the most labour-intensive batter you’ve ever made, but just think of the satisfaction when it’s finished. 6. At this point you transfer the batter in appropriate-sized dollops to your muffin or mince pie tin. You can just put it straight in (Bobby does), but a really handy tip is to cut thin strips of baking paper and put one across the middle of each hollow in the tin, before adding the batter on top (making the strips long enough to leave yourself little “handles” on either side of the batter). It’s slightly boring to cut all the strips, but it makes lifting them out really easy when they’re cooked. Definitely a good thing to remember when mince pie season comes around. 7. Bake for about 15 minutes, or until they seem golden and springy to the touch. Let them cool in the tin for five minutes or so, then move onto a cooling rack. It is at this point in the process of making fairy cakes, muffins or pies, that you would be tempted to try a couple while they’re warm, but you’d be afraid of running short. No such worries here. Eat twenty of them while they’re warm. You’ll still have enough left to feed an army. There! A lovely muffin recipe, and no murders. If you’re a keen cook, frustrated by my provision of one recipe every eight months and a lot of waffle about poker in between, my beautiful sister-in-law has a proper food blog full of delicious things, and she never wastes time with bad beat stories or grisly anecdotes about criminals she has known. I generally stay at Caesars for Las Vegas poker tournaments and always have at least one dinner at the Mesa Grill there. Are the muffins very spicy? With the jalapeno chillies etc, I don’t like hot curries or very spicy flavours. Are these mouth-heaters? Thank you very much for taking the time to post that recipe. I love muffins and cannot resist having one with a coffee every day in my favourite coffee shop. But I have never tried making any. I must save this page and make a note of the ingredients together for a muffinfest at the weekend! Now i must rush out to my cryptic crossword group - I wonder if the word ‘prostitute’ will occur in any of the clues, no surely not as the Times is much to posh. Isn’t it? Although of course the word has more than one meaning. Thanks again and have a good day. JBL - Actually no, they’re not spicy. You can leave the chopped red peppers out if you don’t like the taste of peppers and that won’t harm the muffins at all. And if you particularly WANTED them spicy, you could put more of the chopped chillies in. But that current mix (above) doesn’t make a “mouth heater” at all, it’s a complex mix of flavours but not spicy in the hot sense at all. I never had corn muffins until I went to a Kenny Rogers Roasters restaurant in the Philippines. They are only 90p a box there (bless you, exchange rate dynamics). I can’t imagine by what trajectory Kenny Rogers’ career has gone from singing with Dolly Parton to flogging roast chicken. I suppose they both involve knowledge of plump birds. Thanks for the recipe. I tried it but mine went a bit wrong. I now know that ‘a cup’ refers to a very specific volume, and my one from the British museum with the picture of the Teracotta Army on it is well above it. For my benefit, would you mind sticking to blogs about murder as I’m less likely to be tempted to try that. Not being a big muffin fan, I’m more of a jam doughnut man myself (not those soft ones from krispy kreme covered in dust, the proper ones you can get from Beigel Bake in Brick Lane or an old fashioned bakery, which has a real sugar coating), Anyway, I was more interested in the Thai prostitute murder story and had a quick look on google to see if I could find it but could only find this http://www.independent.co.uk/news/uk/crime/man-jailed-for-30-years-for-lovers-suitcase-murder-2015848.html, very similar, but not the same; could you point me in the direction of the story? Also, can someone tell me how to stop Thai Prostitutes appearing on my browser every time I start typing T? Sorry Philip - I think it’s an American thing, to list ingredients in “cups” rather than by technical weights and measures! But, you know, a normal sized cup. Not an OVERFLOWING MUG. Then again, I don’t think it matters much as long as you use the same vessel whenever it’s “a cup of” something. If the consistency of the batter doesn’t seem right (it should be gloopy, dolloping off a spoon not pouring or rigidly sticking) then just add more of the wet ingredients or the dry, accordingly. Sparkly - I’ll probably write about the murder case in my Observer column this week, if I can find the right tone to do it, so it would be up on the ‘writing’ page of this site on Sunday or Monday. In retrospect, my post probably seemed a little ungracious. Sorry about that. I’ll definitely be trying the recipe again! I will let you know how I get on with the PCA muffins. Umm! savoury sounds good to me - makes a change from sweet. Will try them at the w/e. Vicky, I’m not familiar with the story of the murder to which you’ve referred but is it too late for you to go to Thailand with a can of lager, some muffins, a mobile phone, an item of clothing that is suitable for the conditions and a poker set and say “Come on (insert nickname of murderer), it’s Teacup” and try to talk him into coming quietly? That’s best practice in such circumstances. And that should be followed by trial by Facebook groups. For the technically minded, an American “cup” is equivalent to 16 American tablespoons*, 8 fluid ounces, or approx. 240 ml. As to why we measure dry goods by volume rather than weight, I… have no idea, actually. With things like flour, we’re just asking for trouble. Many apologies. Corn muffins are worth the trouble, though. I like mine with honey for an after-dinner treat. * Smaller than the British tablespoon, apparently. Putting aside the ‘Delia impression’ for just a minute but pertaining to this blog, I would like to ask: How did you feel when you discovered your friend was a murderer? How do you feel now? Have you reassessed your relationship not just with him but with others? btw. the ‘take two Thai prostitutes’ gag was in poor taste..
Mike is off out to buy ingredients for PCA Muffins Shock. The so-called cake baker and general food lover has been spotted in Sainsbury’s buying peppers and chillies. He then was seen coming out of John Lewis with 10 muffin tins. When questioned by reporters from the Times he declined to comment and then got into a waiting taxi which roared off in a belch of diesel fumes. I love your tv shows and always make sure I watch them all. How is Johnnie? he doesn’t seem to appear with you on your shows anymore, why is this? I await your next cookbook with great anticipation. At a 9 pro table @ at least 100 hands per tourney x 100 tourneys, assuming everyone knew everyone’s patterns perfectly, would everyone win 11.1%? Logically, the game should then break down to hand strength, which would level over 10,000+ hands. Or if not, who would win of players you know, and therefore is that person better at playing by ‘feel’? “Take two Thai prostitutes….” Tuts. You have a very sick sense of humour Miss Coren…That said, I did think “Gazza and Moaty” would make a great cartoon strip…so, err, yeah. ANYWAY. “she never wastes time with bad beat stories.” Hey, I love bad beat stories. When I said poker was a “monstrous waste of time” I sort of meant it in a certain context, and reflects my sort of love-hate relationship with the game, if you were the slightest bit irritated by my remark. If you’re great at it, can make good money off it, make money in extra ways off it, sponsorship, TV, radio, then it’s obviously a marvelous non-waste of time. Also, if someone just treats it as a bit of fun, don’t mind losing what they can afford to lose if they’re playing real, then it’s also great. But for the people in between, that try to get good enough to make money at it, for most it can be a frustrating, huge waste of time, as they’ll never quite make the grade. Personally I’ve spend enormous amounts of time discovering I have the amazing ability to roughly break even :D. Although I guess I should rejoice, as I heard that 80% who play lose money, so if that stat is correct (although I doubt it’s that high), I guess I should rejoice, as I’m in the top 20% of players! I wouldn’t say I have a natural talent for it, though, but I think I’m improving…EXCEPTIONALLY slowly. So, do we have to give the muffin mix a good bad beat with a wire whisk? Ha ha har… hey, this comedy lark isn’t as hard as it looks. My dog’s got no nose… Jamaica? erm, er… oh. Lego, “Gazza and Moaty” wouldn’t make a great cartoon strip. It would make a great play in which the playwright could suggest what might have happened if Gazza’s mission of mercy had not been thwarted by the police. It could even be improv-based with Gazza being played by a different actor every night or by members of the audience. However, where could such a work be staged? “Gazza Saves The World” would make a great cartoon strip. Perhaps the next story will feature our hero cutting short his post-Rothbury trip to the Gulf of Mexico and rushing to the Korean Peninsula and trying to get Kim Jong-il to go fishing with him in the Demilitarised Zone instead of starting a nuclear war. It may even appear in the next issue of Viz magazine. Hey, Vicky, you mean to say that you actually have time to make muffins? Is this what I pay my TV licence for? Surely it is cheaper to go across to a local cafe and buy them? Having said that however I am sure the majority of your followers would like to try your muffins. I have just cooked a batch of your PCA Muffins edited method. I managed to get 16 muffins using the measurements you said in the recipe. But my measuring cup was maybe quite small compared to the one that Bobby used. I used a 12 capacity muffin tins which produced some big boys - each muffin was about 2.5in in diameter at the top and about the same in height. But the thing I want to say is that they were delicious, and I could not wait to try one before my coffee was ready! They will certainly not disappoint anybody who reads this and wants to try a batch. I suggest they would be fantastic as an accompaniment to a bowl of tomato soup. Thanks again for passing this wonderful experience on to your followers. Hurray! I’m delighted the muffins worked out for you. Interesting you only got 16 - must be the tin as well as the measuring cups. Using my “mince pie tin”, I get at least 40. I made 23 savoury fairy cakes today using your recipe. Bearing in mind your warnings regarding the amount of muffins likely to result, I used half your recommended quantities. I put a tablespoon sized dollop in each hollow on top of a strip of greased greaseproof paper and it worked a treat. I have to say, bearing in mind the raft of ingredients in the mix they were actually suprisingly American. Mike’s suggestion that they would go well with tomato soup is an excellent one. I am now off to try your sister in law’s recipe for a raised pork pie. Yes I too am impressed with your sister-in-law’s recipe blog and will soon be trying one of her recipes myself. Recipe Rifle here I come!